Barley fans! If you haven’t already tried making risotto with pearl barley you should definitely give it a go. It’s of course a little chewier (in a good way!) than Arborio rice, but just like the classic; it has a rich and creamy texture. And with the addition of dried porcini mushrooms, fresh cremini mushrooms and spring asparagus, you can expect just as much flavor! Mushroom risotto is sort of a standard I think. And I’m a big fan. Mostly because I love the way dried porcini mushrooms add such rich flavor to a simple dish. It’s like they have some umami magic. Actually they do! The concentrated flavors of dried mushrooms are umami powerhouses! Something fresh mushrooms can’t achieve on their own. Undeniably comforting, you can enjoy a barley risotto with mushrooms (cause it’s especially good with mushrooms) all year round. You can even add some peas or spinach for a pop of color. BUT at this time of year, it’s the green asparagus that brings in some fresh spring flavors. Delicious. Just like traditional risotto, this barley risotto is made by cooking the barley slowly and gradually in broth. You begin by cooking the barley in a mixture of sautéed shallots, garlic, and mushrooms, and dry white (for flavor!) and add just add a generous ladle of hot broth to the skillet and allow the liquid to be absorbed, stirring occasionally, before adding more broth. You repeat this process until the barley is cooked and the broth is gone. Of course, there is some work involved with all that stirring, but it’s not nearly as much stirring as a traditional risotto. And if you have a bottle of wine stationed near the pot, some music playing and a maybe someone to have a chat, then you will hardly notice the time going by. 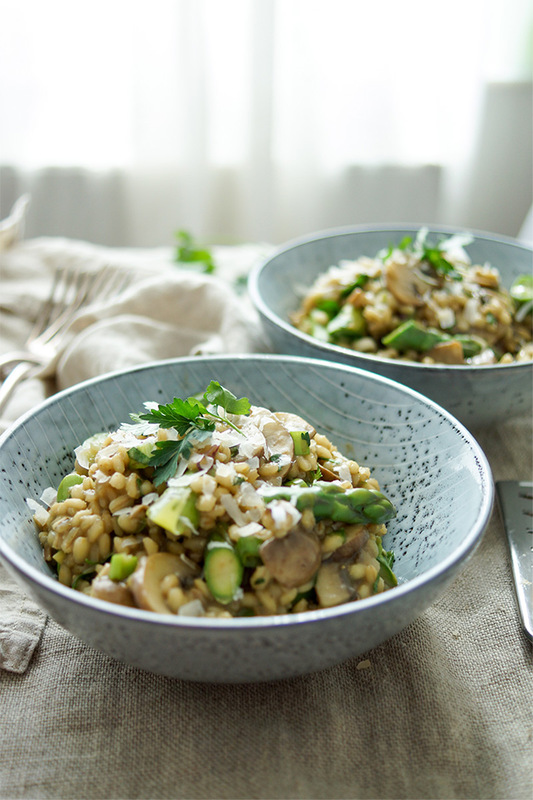 Don’t worry about distractions, this barley risotto with mushrooms and asparagus is very easy to make (AND it’s a complexly flavored risotto and worth the wait!). 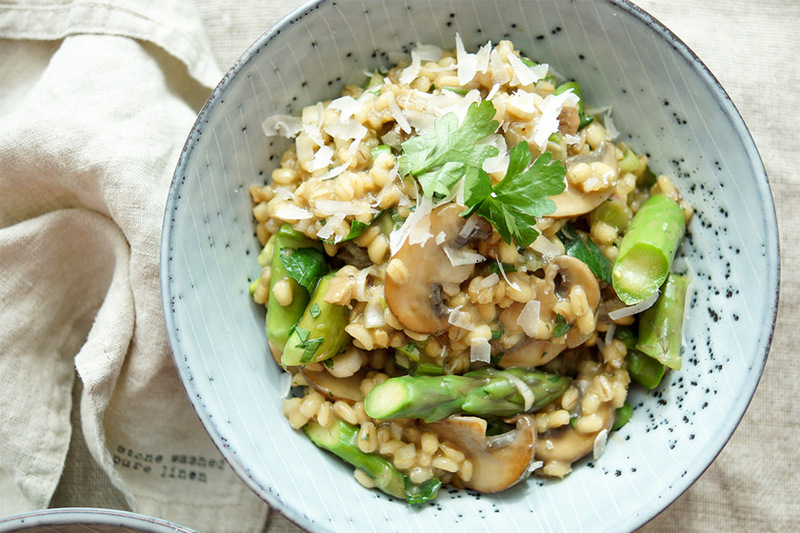 A recipe for a mushroom barley risotto with spring asparagus that you will love. Using pearl barley instead of risotto rice makes an easy, nutritious and filling meal. 1. In a heatproof bowl, pour 1 cup of boiling water over the dried mushrooms, and let stand for 30 minutes. Drain the mushrooms, reserving the soaking liquid. Coarsely chop the mushrooms and set aside. In a saucepan, bring the mushroom soaking liquid and broth to a simmer; reduce the heat and keep warm on the stove. 2. Meanwhile, blanch the asparagus in large pot of boiling water. To do so, add the chopped asparagus and cook until become bright green, about 1-2 minutes. Drain in a colander and rinse with cold water. The asparagus should still have some snap to it but not taste raw. Set aside until ready to use. 3. In a large deep skillet or pan, heat the oil and butter over medium-high heat. Cook the shallot and garlic until softened (but not browned), about 2-3 minutes. 4. Add soaked mushrooms and the sliced mushrooms and sauté, stirring frequently, for 4-5 minutes, until softened. 5. Add the barley and cook, stirring to coat, for 1 minute. Reduce the heat to medium. Add the white wine, cook until reduced. Then add the hot broth mixture, 1 cup (250 ml) at a time, stirring after each addition until the liquid is absorbed before adding more. Continue until reaches a creamy consistency and the barley is tender but still slightly firm (al dente), about 45 minutes in total. 6. Add the asparagus and continue to cook for 1-2 minutes, until asparagus is warmed. 7. Stir in the parsley and green onions. Season with salt (1 teaspoon or more) and pepper, to taste. Serve topped with freshly grated parmesan cheese. Enjoy! I used chicken broth for this recipe, for a vegetarian version; feel free to use vegetable broth. If you are following a vegan diet, then go one step further and substitute the butter for a vegan alternative and skip the parmesan cheese as garnish. I like to blanch my asparagus so I have complete control over how cooked it will be. It could however be added directly to the risotto and cooked along with the barley. You can try adding it on the last cupful of broth, the liquid will help cook the asparagus. 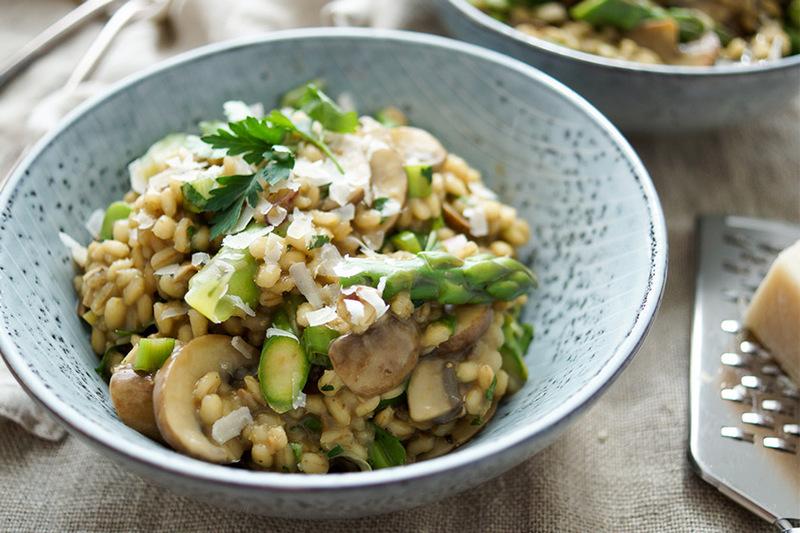 If you make this Mushroom Barley Risotto with Asparagus recipe, I’d love to hear how it turned out for you! Be sure to rate it and leave a comment below to let me know! Especially if you have tips for other readers. Or take a picture and tag me on Instagram @ellerepublic and don’t foget to hashtag #ellerepublic so I don’t miss it!